The price tag for each new Kudankulam unit would be around $2.5 billion, two and a half times the cost of first and second units of the nuclear power plant. India and Russia are going to sign an agreement for the third and fourth units of Kudankulam Nuclear Power Project (KNPP) in the southern Indian state of Tamil Nadu “within a few weeks,” a key official involved in the negotiations told RIR. 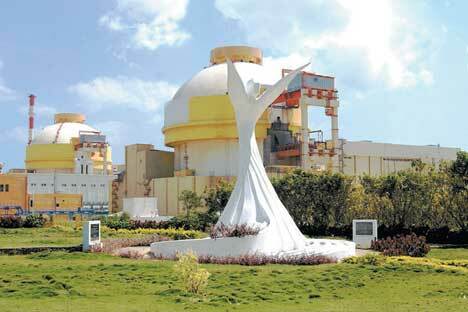 The contract for the third and fourth units of KNPP is likely to be signed in March 2014. “The technical negotiations are close to completion and the two sides are going to sign the agreement for KNPP 3 and 4 within a few weeks. I can’t disclose the costs and exact timeline for this. After this, India and Russia are going to collaborate on setting up at least ten more nuclear reactors in India. But that is going to take some time. Right now we are focused on sealing the third and fourth units of the Kudankulam project,” the official disclosed on condition of anonymity. It is understood that the Russians have agreed to build the third and fourth units of KNPP under the framework of new Indian nuclear liability laws, though at a much higher price. Sources said the price tag for each KNPP unit would be around $2.5 billion, two and a half times the cost of first and second units of KNPP. It will be a grand achievement for the outgoing United Progressive Alliance (UPA) government of Prime Minister Manmohan Singh even at the jacked up prices considering the fact that it will be India’s first international contract since the Indian parliament passed a legislation on August 25, 2010, now known as The Civil Liability for Nuclear Damage Act, 2010. The Act, which came into effect from November 11, 2011, stipulates the maximum amount of liability in case of a nuclear accident at $240 million but it is not clear how much the supplier (read ‘Russia’ in context of KNPP 3 and 4) will have to shell out. The minimum liability amount for the foreign supplier will be $80 million in case of an accident because of flawed equipment. Because of this stringent liability law, India has not been able to get a single new nuclear project signed. All foreign powers, including Russia and Canada, are upset over the Indian liability laws and have thus far stayed away from entering into new contracts with India all these years. Rosatom chief Sergey Kirienko was on a short visit to India on February 24 for ironing out the last-mile problems with regard to the KNPP 3 and 4 negotiations. Two days later the issue came under sharp focus at the political level when Russian Deputy Prime Minister Dmitry Rogozin held talks with his Indian interlocutors in New Delhi during his two-day trip. This issue came up for some frank discussion when Rogozin and Indian External Affairs Minister Salman Khurshid reviewed progress in India-Russia economic cooperation on February 26. The two dignitaries chaired an inter-sessional meeting of the India-Russia Inter-Governmental Commission which focused on nuclear, space, energy and economic cooperation. According to Indian official sources, the two dignitaries assessed the progress made in Kudankulam nuclear power plant rapidly achieving full capacity and hoped that the first unit of the Russian-built nuclear power plant will achieve full capacity by April-May this year. They also reviewed the rapid progress being made on completion of Kudankulam-2 and hoped that it would be connected to the power grid before the end of the year. “There was a general agreement to build on the momentum underway and conclude at an early date, General Framework Agreement on Kudankulam-3 and 4,” these sources said. On another issue, Rogozin and Khurshid agreed that the India Trade Show to be held in Moscow in 2014 September would be an appropriate opportunity for ensuring that major tie-ups could be reached between businesses of both sides. The possibility of Russia being the partner in the India International Trade Fair in 2015 was also discussed. The writer is a New Delhi-based journalist who tweets @Kishkindha.